So, Jurassic World looks very interesting as fourth sequels go: a logical extension of the idea of Jurassic Park, where the kinks have been (apparently) worked out, and Ingen have turned the park into a global franchise a la Disney, or Universal Studios. Or Delos. Of particular interest to me are the dinosaurs themselves. Well, a recently leaked Jurassic World prop brochure had a list of at least some of the dinosaurs which may appear, at least at the new Isla Nublar park. No surprise to see T.rex and Triceratops on there, as two of the most iconic dinosaurs which have appeared in all the films so far. Parasaurolophus is also a veteran of the first three. Stegosaurus too, via an offscreen mention in the first Jurassic Park (as one of the vials of DNA stolen by Nedry, mislabeled "Stegasaurus" - either this was a subtle allusion to the idea that InGen are reckless and don't know or care the first thing about dinosaurs, or the palaeontologist consultants were off to lunch while Spielberg shot this scene), while it made proper appearances in the two sequels. Gallimimus is obviously best known from the stampede scene in the first film, but it seemed to take a break for Jurassic Park III. Pteranodon popped up in the two previous sequels, while Pachycephalosaurus and Ankylosaurus only appeared in one previous film each (The Lost World and Jurassic Park III respectively). There are a couple species conspicuous by their absence: no Dilophosaurus or Brachiosaurus, for instance, despite their significant appearances in the first film. Isla Nublar was napalmed in the novel and game and thus all the dinosaurs perished - another reason I break from the consensus to say I find the films to be superior to the books, and I say that as a Crichton fan - but Brachiosaurus at least is present on Isla Sorna. Ceratosaurus, Compsognathus, Corythosaurus, Mamenchisaurus and Pachycephalosaurus may be unique to Isla Sorna in the film universe, and it's easy to see why Spinosaurus may have been considered far too dangerous for a theme park. However, there's an even more notable omission: surprisingly - or perhaps unsurprisingly given the events of the three previous films - Velociraptor appears to be absent from the brochure, and thus, the park. I can only assume they were considered too dangerous for a theme park, and not as (relatively) easily contained as a Tyrannosaurus. Even so, it's clear the film franchise which made Velociraptor a star (albeit three quarters of a century after its discovery) wouldn't leave them out, and it appears that they have indeed been confirmed. So what about those new dinosaurs? THIS IS WHAT JUDAS PRIEST WARNED US ABOUT. I think it's safe to say even those strange individuals which are not obsessed with dinosaurs are familiar with Apatosaurus, either by its current taxonomic nomenclature, or its informal pseudonym Brontosaurus. Apatosaurus hasn't appeared in the flesh in the Jurassic Park series, though there's speculation that its skeleton appeared in The Lost World: Jurassic Park. Apatosaurus was actually one of the stars of the original novel by Michael Crichton, but was replaced with Brachiosaurus for the cinematic adaptation - a case of affirmative action to increase the media presence of the neglected Macronarian sauropoda, which I'm alright with, since Apatosaurus nee Brontosaurus is one of the most frequently represented dinosaurs in cinema. I live in hope that one day we'll see my beloved Diplodocus on the big screen again, but for now Dippy's cousin Mamenchisaurus and now Apatosaurus will have to represent the Diplodocoideans in the Jurassic Park fanchise. 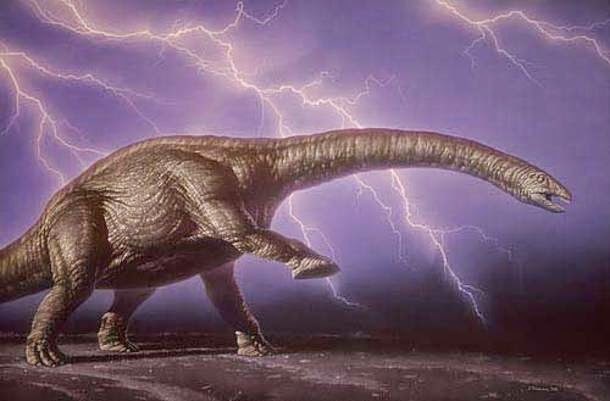 If I were to go with a "realistic" (according to current palaeontological concensus) Apatosaurus model for JW to emulate, it'd be Sideshow's Apatosaurus, no contest. But JW isn't Walking With Dinosaurs or Planet Dinosaur, and this isn't a reboot. 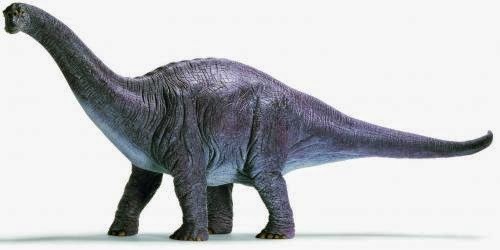 Personally speaking, I'd love for JP's Apatosaurus to resemble Schleich's 2008 model. It's a fascinating blend of modern and antiquated notions of sauropods: it has the active pose and general vigour of a modern creature, but also many anachronistic hallmarks - pachydermesque skin, visible toenails, rounded back - which put it in that halfway house which Jurassic Park currently inhabits. 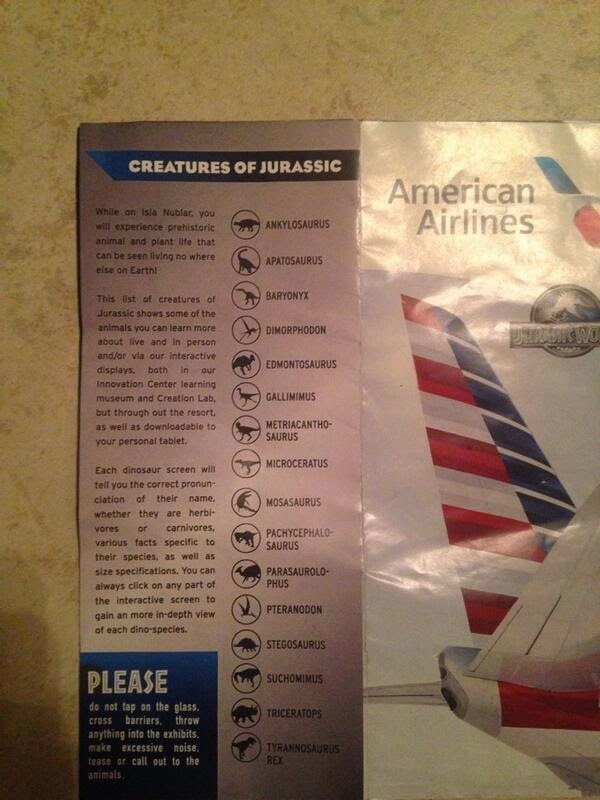 When it was released, Jurassic Park was cutting-edge: now, unfortunately, palaeontology has marched on. But the public is still tied to the old memory of Dinosaurs as Monsters - the weird rejection of Dinosaurian feathers is testament to that - so perhaps, in a way, InGen are tapping into that perception of what a dinosaur "should" be like? 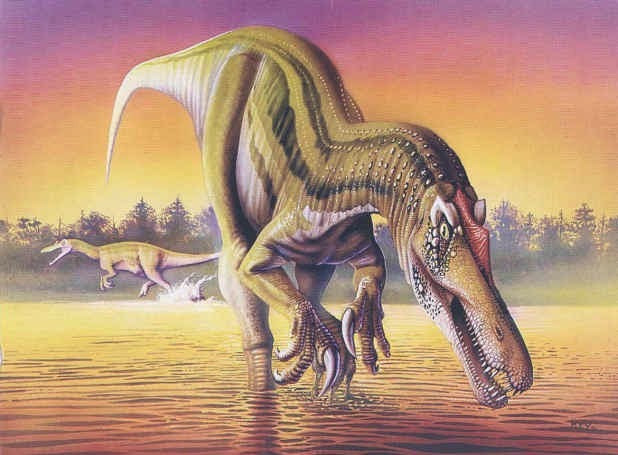 Always had a soft spot for Luis Rey's garish Baryonyx. Alan Grant: How would you classify it Billy? Billy Brennan: It's a super-predator: Suchomimus, the snout. It's interesting that Jurassic Park is giving all this attention to the Spinosaurids, considering that unlike the Deinonychids, very little was known about them until fairly recently: the original Spinosaurus fossils were destroyed in an Allied bomb raid in the Second World War, and the first reasonably useful remains of one of its family were only unearthed in 1983. Named for and discovered by this man, William Walker. Yes, that's 1983: much like myself, Mr Walker sports facial hair more suited to the Golden Age of Palaeontology than today. The Whiskers That Time Forgot. Now this one genuinely surprised me. 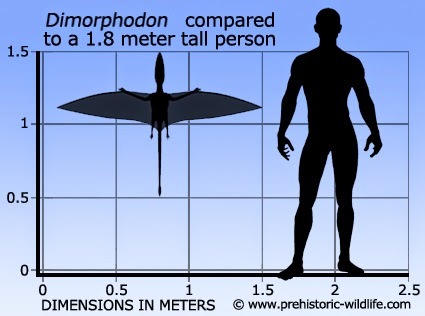 Dimorphodon isn't so much grandly magnificent or viscerally terrifying as it is adorable: with a wingspan roughly the size of a cormorant's, but a fraction the body weight and size, it's pretty much the closest we'd get to a "handbag" dragon like Daenerys' babbies in "Game of Thrones." On the other hand, the Compsognathus of The Lost World: Jurassic Park was also cute, wasn't it? 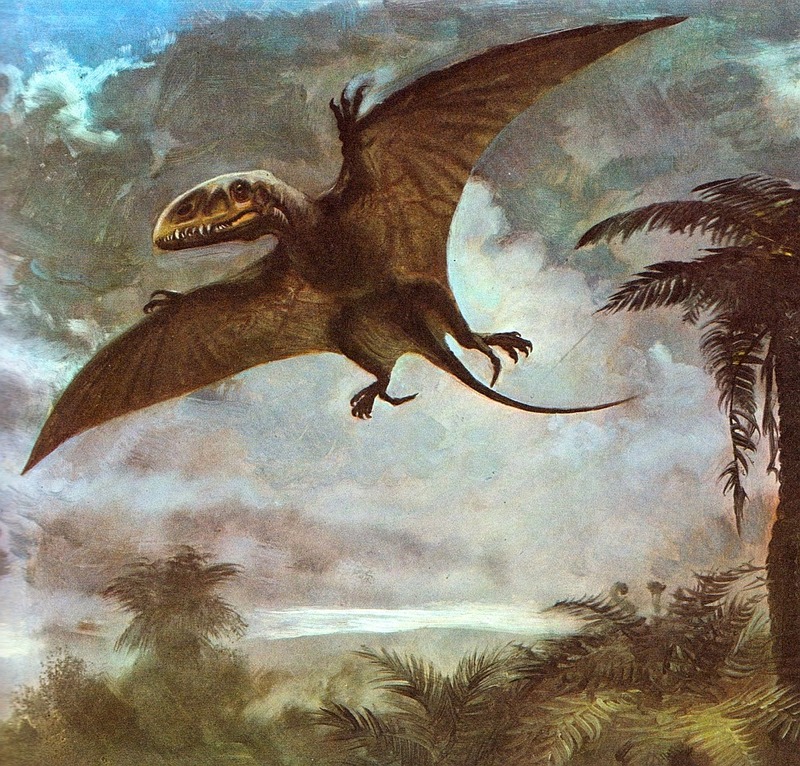 There are a couple of possibilities for Dimorphodon: first, it could be part of the "pet dinosaur" aspect of the normalization of resurrected dinosaurs. Who wouldnt want to own their own miniature dragon? Alternatively, I have a nasty feeling they might end up just being variations on the "flying pirhana" Anurognathus from "Primeval": they certainly have the teeth for it. I'm somewhat hoping for the former, if only because it'd be nice to have more dinosaurs that weren't Prehistoric Monsters. Edmontosaurus had an extremely brief (and gory) cameo in The Lost World: Jurassic Park - as a skull picked clean by Tyrannosaurs. Pretty sure there's a Shakespeare allusion I could make here. Um... "Exit: pursued by a T.rex?" Given poor old Edmontosaurus is one of those stock dinosaurs, it'll probably be given a similar role to that of Parasaurolophus or Corythosaurus in previous films - "Majesty of Dinosaurs" shots, stampedes, or victims to carnivores/human greed. Perhaps, given their generally docile nature as ascribed in many films, they'll be features in the Jurassic Petting Zoo? I'm using this picture not just because I'm a fan of the artist's, but because it reminds me of those pictures of dogs in the back seat of cars leaning on the driver's shoulder, making it look like the dog's driving the car. 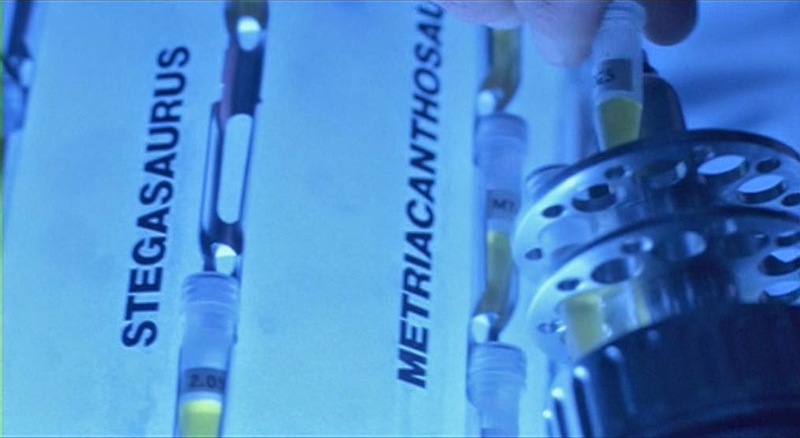 Metriacanthosaurus was another dinosaur whose DNA was stolen by Nedry in the first film. 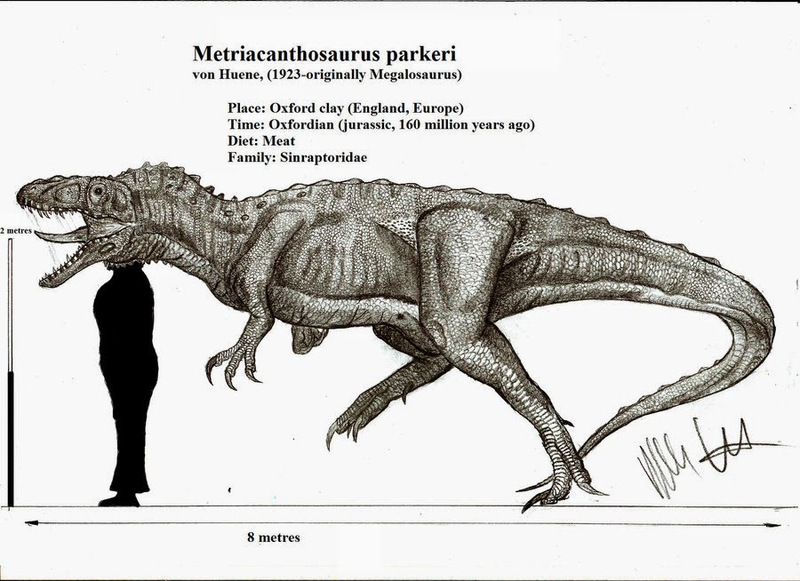 The creature is somewhat halfway between a T.rex and a Velociraptor in size, at 8m/26ft long and 2m/6ft tall, not too far from the dimensions of the Carnotaurus from The Lost World novel. Now, it could just be my wild speculation, but I wonder if the Jurassic World's Metriacanthosaurus will borrow some elements of the Carnotaurus from the novel - namely its camouflage? That way it handily adopts the stealthy nature of the Velociraptor with some of the size and power of the T.rex, rendering it a particularly nightmarish creature. It's the size of a bunny. A BUNNY, fercryinoutloud. Microceratus was another novel creature, albeit under its older (and better) name, Microceratops. It, too, is adorable. I see it fulfilling a similar role to the baby Triceratops from the book, as another "handbag dinosaur" suitable for Jurassic Children's Zoos around the world. If the director/writers are feeling brave, they could use Microceratus as an example of consumerist breeding having further ethical concerns, as an already cute animal is altered into an animal incapable of survival in the wild, as seen with many pug mixes and dwarf cats. When Mosasaurs make size charts, they refer to humans as "bite-sized." This may be Mosasaurus' first big foray into the Jurassic Park franchise outside of games and possibly comics, although its relative Tylosaurus had a big part in Jurassic Park: The Game. It'll be interesting to see the context Mosasaurus appears in: will it just be for a one-off shot of a Jurassic Seaworld (again, if the filmmakers are brave there could be animal rights protesters evoking Blackfish), or will it be for a big set-piece? I think Jurassic Park III was enough for a river adventure with a gargantuan super-predator, but perhaps the film will have some surprises. 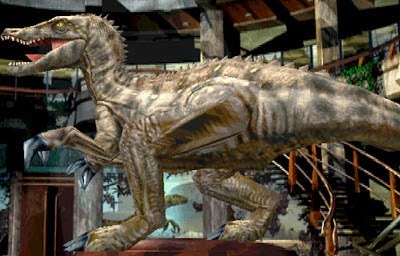 Suchomimus was one of the combatants in Warpath: Jurassic Park. Essentially, Street Fighter with DINOSAURS. It was glorious. Of course it was! Suchomimus was, of course, Billy's first guess at the super-predator of Jurassic Park III, and we also know was also on InGen's list along with its smaller cousin Baryonyx (for scale, see aforementioned smaller cousin). I must confess, it's strange to see three Spinosaurs come up in Jurassic World - especially considering we've only seen one dromaeosaur in Velociraptor, and haven't yet seen another large ceratopsian or stegosaur. From The Lost World to Transformers, there wasn't a lot of variation in dinosaur form - if filmmakers even went to the effort of making dinosaurs look like actual dinosaurs. 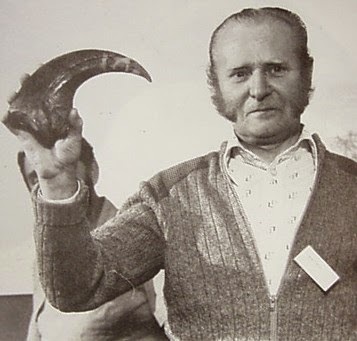 If you're lucky, you'll see a Styracosaurus instead of Triceratops, as in The Valley of Gwangi and the 1975 adaptation of The Land That Time Forgot - Jim Danforth went further with a Chasmosaurus for When Dinosaurs Ruled The Earth. Ray Harryhausen mixed things up with a Ceratosaurus to accompany the requisite Allosaurus in One Million Years B.C. But these amounted to variations on a theme until Jurassic Park came along, and the truly unusual dromaeosaurs were such a hit it's hard to imagine any child's dinosaur collection not having a "raptor" in there: so too did we see a greater role for Macronarians in Brachiosaurus, and Dilophosaurus (even though it's going to be hard to shake the poison spit & frill). 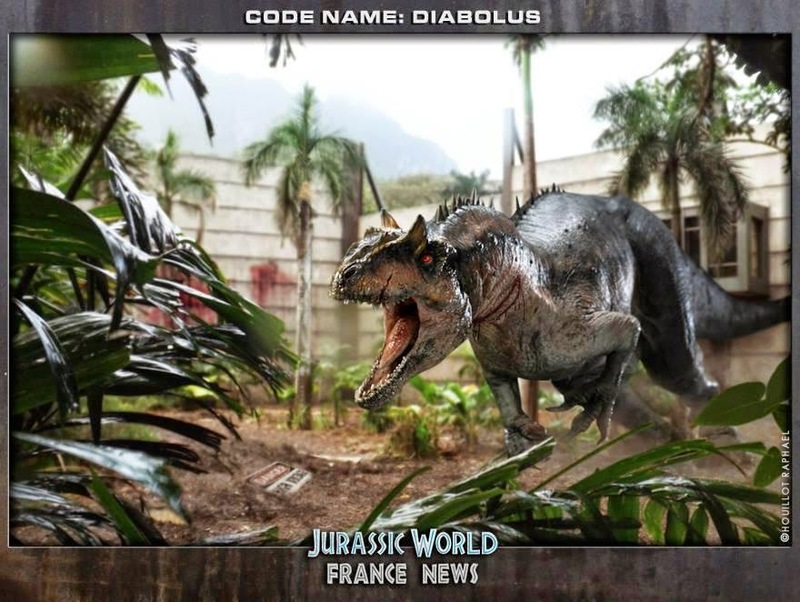 With Jurassic Park III, now Spinosaurs are getting a good shake of the stick - and why not? With their crocodilian snouts, bear-like arms and claws, and distinctive sails, they're highly distinguishable from any other type of dinosaur. Billy Brennan: I don' t remember that one being on InGen's list. Alan Grant: Because it wasn't. Which makes you wonder what else they were up to. Out of the listed dinosaurs, only Metriacanthosaurus seems significantly distinctive enough from previous dinosaurs to fit. Baryonyx and Suchomimus are essentially smaller Spinosauruses, and Mosasaurus is restricted to the sea: why would you need to leave the lights on if you aren't on the coast? I suppose Trevorrow could be referring to Dimorphodon, but as any 8-year-old knows, pterosaurs aren't dinosaurs. Metriacanthosaurus is small enough to (barely) fit through a doorway, prompting a possible desire among viewers to leave the lights on; it's sufficiently "badass" as a medium-sized theropod; it's easy enough to distinguish from raptors and T.rex based on size and morphology alone; and on top of all that, ties into the first film via that tantalising scene in Cold Storage. My guess is Metriacanthosaurus might be the mystery beastie. Of course, this mysterious new dinosaur could also be one that isn't on the park list. InGen is nothing if not extremely secretive, even with its own people, as seen in TLW:JP, and it's all but confirmed they're up to no good in JPIII. There are a few beasties from throughout the Jurassic Park franchise that might yet turn up. There are several creatures from the novels which have yet to make the leap to cinema: Carnotaurus is a perennial favourite from The Lost World. A couple of the dinosaurs have made the leap from novels (Apatosaurus) and even games (Suchomimus) already. There are also dinosaurs alluded to in supplementary materials, or as brief "Easter Eggs": Herrerasaurus, Proceratosaurus and Segisaurus may have been some more of the embryos stolen by Nedry in Jurassic Park, as well as seen in a brochure. Troodon could make the leap from Jurassic Park: The Game. "Despite protests from Dr. Sorkin, the board has unanimously agreed that species (IG74726f6f646f6e) should be stricken from the park population. All embryos and genome data will be shelved and the current stock euthanized. Behavioral and physiological traits of the lot plus its inherent nocturnality make it a dangerous species to handle with very little tourism appeal." Well, perhaps not, if they want to keep a PG rating. Or ever sleep again. In any case, it's fun to imagine what new dinosaurs could turn up in a Jurassic Park film. Will they do what they did with dromaeosaurs and spinosaurs with a new family? My own pet choice would be a Therizinosaur like Nothronykus, Segnosaurus or Therizinosaurus itself, but I think an Oviraptorosaur, Alvarezsaur, Heterodontosaur, or Abelisaurid would be distinctive enough from the stock dinosaurs. I live in hope we'll even see some very unusual ones like Scansoriopterygids or some of the stranger sauropods. There are tons of more, non-dinosaur specific questions for Jurassic World: how has the world changed with the normalisation of cloned dinosaurs? What new ethical or moral dilemmas have ensued? How has the knowledge of dinosaurs changed - or not - since Jurassic Park became public? And just what in blazes is this thing? Normally this is the part where I'd panic, but I've become used to weird stuff in Jurassic Park by this point. 8-year-old Aly used to drive his classmates nuts when he ranted about Dilophosaurus' frill and the giant Velociraptors. I know the idea of a modified dinosaur put a lot of fans on red alert, and I understand it. But we aren’t doing anything here that Crichton didn’t suggest in his novels. This animal is not a mutant freak. It doesn’t have a snake’s head or octopus tentacles. It’s a dinosaur, created in the same way the others were, but now the genetics have gone to the next level. For me, it’s a natural evolution of the technology introduced in the first film. Maybe it sounds crazy, but most of my favorite movies sound crazy when you describe them in a single sentence." It's easy to be very cynical about this, especially considering this is hardly the first time we've seen genetic mutants in the Jurassic Park franchise, and the dinosaur-human hybrid concept art which was alleged to be brainstorming for Jurassic Park 4 certainly rubbed people up the wrong way. But frankly, I'm in agreement with Trevorrow: Jurassic Park has already gone way off the fossil record in its depictions of Velociraptor, Dilophosaurus, T.rex - well, pretty much every dinosaur in the films are inaccurate on some level. However, the beauty of Jurassic Park is that this is all handily explained in Jurassic Park III (I know, I know): these aren't dinosaurs, they're genetically-engineered theme park monsters. The novel discusses this in more detail, but the jist of it is that Hammond wanted the dinosaurs to reflect not the actuality, but the public perception of dinosaurs. At the time, that meant Terrible Lizards, red in tooth and claw, featherless and scaly. And one has to also remember where Jurassic Park's dinosaurs come from, and consider the possibility that the DNA recovered from amber may be from a dinosaur which has yet to be discovered in fossil form - if it ever will. This is not that unlikely, given that the nature of the fossil record itself means that only a fraction of all species have ever been fossilised. There are dinosaurs out there which are known only from mere fragments - for all we know, a species like this Diabolus rex did indeed exist. Ultimately, I hope that Jurassic World can do for a new generation what Jurassic Park did for 9-year-old Aly's: to bring dinosaurs back to popular consciousness, and most importantly, try and get the public perception back up to date. When Jurassic Park was released in 1993, it was state-of-the-art not just in terms of special effects, but palaeontology: it catapulted the discoveries made during the 1970s Dinosaur Renaissance into the mindset of the average moviegoer, and thus normalised the idea of dinosaurs as intelligent, active, birdlike creatures. From the 1930s to around the 1960s, the idea of dinosaurs as stupid, sluggish, reptilian monsters, evolutionary dead-ends, was highly prevalent - even the very name, dinosaur, became a byword for something redundant, outdated, inefficient, antiquated, old and useless in comparison to new and vital. Jurassic Park not only brought back the majesty, but the dignity of dinosaurs as creatures just as worthy of existence as us mere mammals, rather than saurian Nephilim who existed only to perish and usher in the Age of Man. There's still a lot we can learn from dinosaurs, and I think seeing their depictions in popular culture tell us a lot - not just about dinosaurs, but about ourselves. *Ye Gods, this line... See, this is not a case of expecting the audience to know the finer details of dinosaurian taxonomy, this is a case of ensuring that those who do know will be tearing their hair out for no reason whatsoever. If you know what Spinosaurus, Suchomimus and Baryonyx are, it strikes me as next to impossible for you to not also know that Spinosaurus is the biggest and Baryonyx the smallest of the three. It's like knowing what an Eagle Owl, a Barn Owl and a Little Owl are, but thinking a Little Owl is bigger than a Barn Owl. IMPOSSIBLE. Billy is supposed to be training as a palaeontologist. He's supposed to know this! If he knew the InGen species list, then it could only possibly have been Suchomimus or Baryonyx. He shouldn't have had to even pause to think about it! THIS IS NOT HARD (Right, who let 8-year-old Aly out of the broom cupboard? 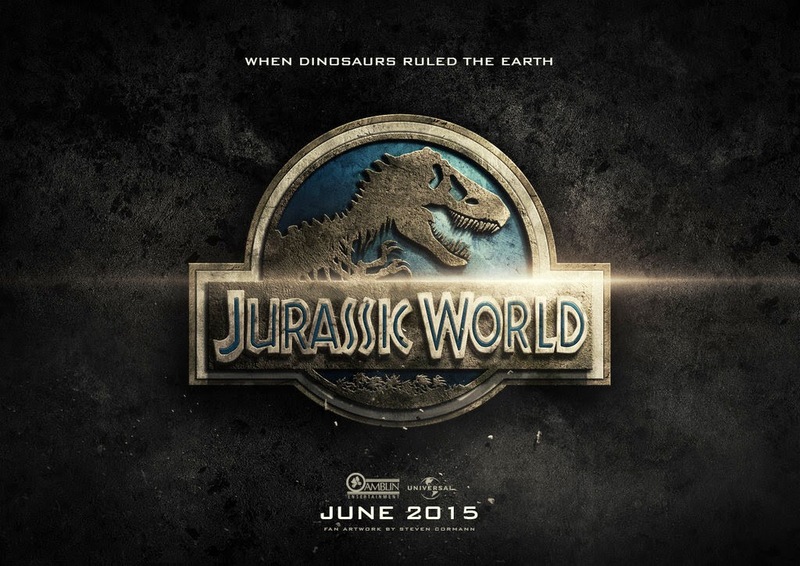 Nothing I've heard about Jurassic World gives me much hope. I kind of hate the director for not including feathered dinosaurs. In 2014, there is no excuse for portraying a featherless raptor in ANY context! We may as well have tail-dragging tyrannosaurs and swamp-dwelling sauropods. I also hate the people who wine about how the discoveries of feathered dinosaurs 'ruined' their childhood. Why are we to be disappointed at nature for being richer than the confines of our feeble imaginations? Supposedly, there will be one shot at the beginning in which people are bored and accustomed to the sight of the dinosaurs, photographing them with their iphones. This is supposed to mirror the audience's jaded attitude, the director said, so he's going to invent some new creatures made through genetic splicing or something like that. I can't help but find this a bit insulting. If dinosaurs are boring to you, then you aren't the right person to make a movie about them. Just remember Grant and Sattler's reaction in the first film upon seeing Brachiosaurs for the first time--they're moved to tears. Their first emotion is joy. As for me, the dinosaurs are precisely the reason to watch any of the JP movies in the first place. The jaded audience is already accustomed to CGI monsters of all kinds, but I dunno, the fact that dinosaurs are real sort of makes them special to me. They're a glimpse of another world more spectacular, yet one that we can ever fully comprehend. As such, it reminds us that our existence is part of something so much larger. It's almost like a religious revelation. At least James Gurney understands that there must be dinosaurs in Heaven, if you accept Dinotopia as the appropriate metaphor. Looks like the fat old female dinosaur 'Scam-o-saurus Windsorii' cast its large shadow over the referendum in Scotland yesterday, what a pity. Experts are still wondering if they will rename this odd creature who infects everything it touches .... "Saxcoburggothosaurus Coprofagus" . Interesting article, but I'd just like to point out an error. In the novel, Hammod is not interested in altering the dinosaurs to match the expectations of the public. They have "real" dinosaurs in the park and he is satisfied with that. It is Dr, Wu who wants to make changes to the animals. He asks Hammond to allow him and his team to make the animals slower to match public perceptions and more docile to make them easier to handle. The only changes that Hammond ever permitted were the use of DNA from other sources to fill in gene sequence gaps, sterilizing the dinosaurs with irradiation to prevent breeding and making the animals lysine deficient to prevent them causing havoc should they get off the island. Although all three ultimately went wrong, the changes were a matter of getting the job done right, not of aesthetic pleasure.